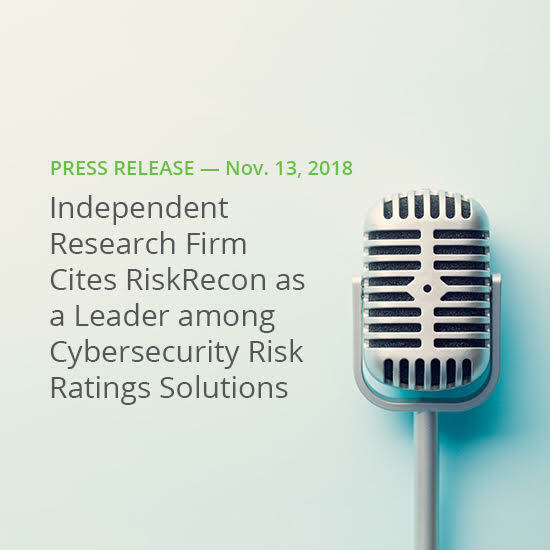 Salt Lake City, Utah, November 13, 2018 — RiskRecon, the easiest path to understanding and acting on third-party cyber risk, today announced it was ranked as a leader in The Forrester New Wave™: Cybersecurity Risk Rating Solutions, Q4 2018. In the report, Forrester, a leading global research and advisory firm, evaluated 9 cybersecurity risk ratings solutions. The report noted that RiskRecon is the best fit for S&R pros that want contextualized cyber-risk ratings. S&R pros who want to understand and prioritize third-party cyber risks based on their own unique business needs and threat landscape should add RiskRecon to their shortlist. How RiskRecon Works By combining advanced models and algorithms with data gathered from publicly accessible IT systems, RiskRecon is able to conduct deep asset discovery, leading to detailed IT profiling, accurate issue identification, and unique asset risk valuation for all third-party (and fourth-party) Internet-facing systems, tailored to the customer’s risk tolerance. This critical information creates the backbone of a risk-prioritized action plan that can be customized to an organization’s specific risk policy. To download a complimentary, complete copy of The Forrester New Wave™: Cybersecurity Risk Rating Solutions, Q4 2018, click here.